The Le Sigh: Premiere: SATU - "Honey"
pastel pink music video directed by Laurence Philomène. SATU is the moniker of UK-based illustrator and photographer Sinead Westwood. They self-describe the project on bandcamp as "lovestruck blossom pop" and this description could not be more accurate. Being a total sucker for pop music, I was dazzled when I was first introduced to the avant-pop songs appearing on their self-titled EP released in 2014. Today we're excited to premiere the music video for Westwood's newest song "Honey." 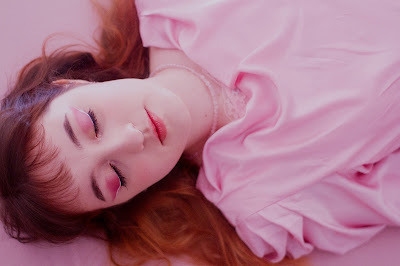 The dreamy footage was directed by one of our favorite visual artists Laurence Philomène and features every shade of pastel pink you could imagine. Watch SATU angelically hum the words to "Honey" while getting ready for the day in the video below. "I usually find it quite difficult to make more sugary songs, because I get frustrated when I have to listen to something so cutesie over and over during the production, so I usually end up favoring darker or stranger sounds to keep it interesting for myself. But with "Honey" I managed to keep a balance between sweet and a bit melancholy, which I really like. I’ve also been working on it since August last year, which is a lot longer than I usually spend on one song, so I had more space to think about what to do with it. I made the track before I wrote the lyrics and got quite stuck with what to write about, so I just started daydreaming and the result was a fantasy love story full of ice cream and road trips and the cool girls I had been crushing on in pop videos. All of my music comes from a very basic mic-interface-laptop setup in/on/around my bed, in my room which is FULL of pink things because the colour makes me happy and calm – and I sort of feel like you can hear the influence of that in the song, which I love." Listen to SATU on bandcamp.